Here's more from our friend in North Carolina. Good info on ERGO. 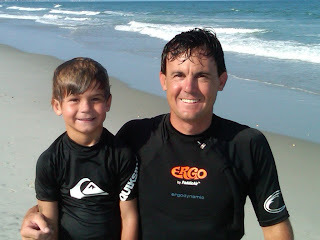 I surfed at Oak Island, NC yesterday and it was a chest high wind blown confused wave. You have to paddle about 100 yards to get out beyond the sand bar. I powered right through the white water with the PaddleAir vest. I've learned not to over inflate the air bladder. Just a couple of puffs is all I need to protect my ribs and keep my board comfortably under me. I am still totally impressed with the power it generates. I am recommending it to a friend o mine, Justin, who surfs with back pain. I think the air support can only help him as he is a middle aged dude like me.